As you can imagine when I weighed myself this morning and the scale read 185, I had to reweigh myself another two times. But alas to my surprise I was up six pounds from yesterday morning’s weigh-in. I knew that I was probably not going to be lighter after yesterday’s salty food intake, but six pounds was a head shaker. Here’s the deal, when you begin a new work out as I have done this week you can expect to gain weight within the first few days. Even though you are burning more calories and your body is using up the fuel you eat, you are also building new muscle. Part of the process of building muscle is that you micro-tear the muscles you are working. When this happens, water rushes in to the muscles to help with the repair process which can be noticed as the muscles become swollen, or as some like to say “swole”. Really the repair process is what we know as the adaptation stage of working out. Our muscles are freaked out by this new workout and the body is trying to adapt to this new routine. So combine this process with a large lunch meat club sandwich, salty fries, and top it off with a sodium time bomb like sushi roles and soy sauce, and congratulations you are going to hold on to ever little bit of water it can find. So if you happen to gain weight soon after beginning a new workout, don’t worry it is a natural process. Keep going, its quite possible that you wont actually lose any real weight for a week or two, and if you are a woman, its quite possible that you wont lose any weight for more than a month. But the weight isn’t something you should really be concerned with right away. There is truth to the fact that muscle weighs more than fat. As you change your body composition (muscle to fat ratio) your weight will fluctuate. The real proof in the process is how you feel. Your energy levels should begin to increase after a couple days. Your posture will begin to get better. clothes will begin to fit looser. And stress levels should be perceived to be lower as well. All in all today’s surprise is all just a part of the process and tomorrow is another day closer to my goal! Workout: Day 4 of Insanity Max 30: Tabata Power (Maxed Out at 10:40 and videoed my 22 Push-ups during that workout) used Acid Check Granules, Himalayan Pink Salt, Beachbody Performance Hydrate and Energize mixed in water. Rode 10.3 miles to Swim Practice. Swim Coaching: Swam a little with the kids while coaching swim practice. Rode 10.3 miles home. Dinner: Turkey, Feta, Romaine, and Dijon Mustard on Wheat Bread Sandwich and a bowl of Honey Bunches of Oats with Almond Milk. I spent the morning organizing my computer, while my girlfriend took care of some stuff for school. Organized folders and files, folders and files. Its the cleanest its been in a long time for sure. Productive time spent for sure. Then I ate entirely too much food for lunch. My Club Sandwich was borderline ridiculous and the fries were too good to pass up! After lunch we went home and took a power nap before jumping into the pool. 4:20 rolled around and it was time to hit my 30 minute workout before heading to swim practice. Swim practice was hot. I was more than happy to demonstrate my technique for starting off the blocks, efficient freestyle stroke, and really any other reason I could think of. It was nice and refreshing. After swim I headed home to find some of my favorite people waiting eagerly to go to dinner. 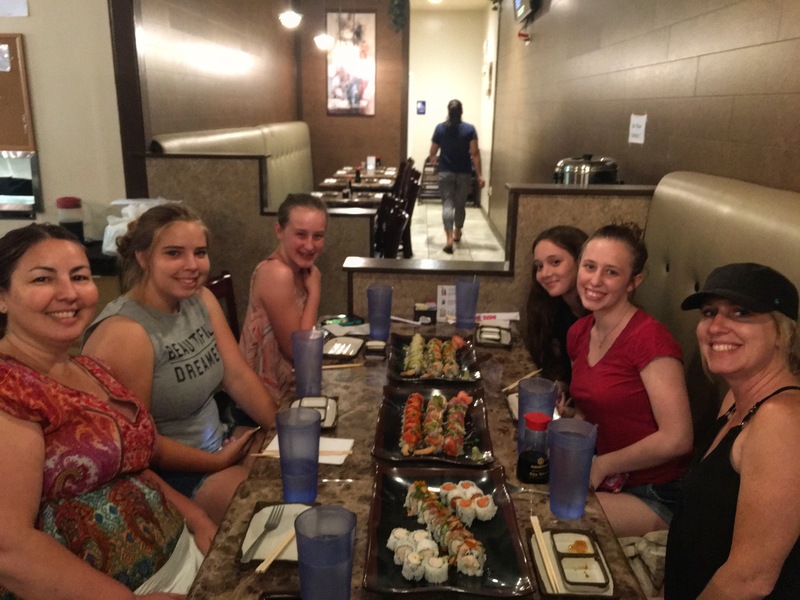 We decided to get a little Sushi after a long day. We love Sushi! OK a bunch of Sushi, but in our defense, there were a few of us. After almost too much Sushi, I hit my 22 Push-ups and now it is time to get some sleep! Workout: Day 3 of Insanity Max 30: Sweat Intervals (Made it entire 30 Mins without stopping or modifying)), used Acid Check Granules, Beachbody Performance Hydrate and Energize mixed in water. My job today was to help my parents throw away some old stuff at my parents house. Little did I know that a hidden treasure had been waiting to be found. As I was picking through the items to load into the truck, I came across a drawer set that I had used in my youth. As I worked my way down through the drawers I found old bike parts and deteriorated swim caps. 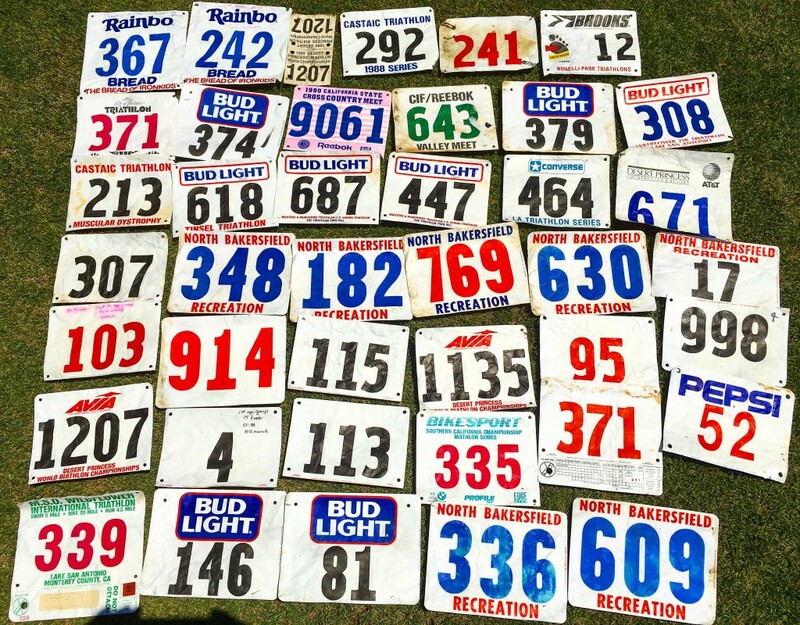 But then to my surprise I found a drawer with a bunch of old race bibs from when I first started doing triathlons up through my Senior year in cross country. As you may have guessed, I was pretty excited. they were in basically perfect condition surprisingly for have been left outdoors for who knows how long. As I looked through them so many old memories flashed back in my head. I never would have thought that I would have found something as treasured as these. It definitely brightened my day. I was like a little kid again and it helped me hurry through and get the dirty work done and over with. I goth the truck all loaded and tarped and headed down the road, but I was starving. I needed to get something and stopped at Carl’s Jr., against my better judgement, but I was hungry and ordered a Charlbroiler Chicken Club, small fries, and a coke. I very rarely eat this stuff, but at this point it was hot and I was thirsty and it tasted good. Eating fast food isn’t the problem. Eating fast food every day is. I continued along on my trip to the dump, which was hot and dusty on this Bakersfield afternoon. Everything I had was recyclable so I made the rounds and distributed the items in their appropriate areas. After the dump, I headed home to get my workout in, jumped in the pool to cool off, and headed to swim practice. It was pretty hot there too, but good thing I am a swim coach and can jump in to cool down every so often. Plus the kids love it when I jump in with them for a social recovery kick after a long set. After swim I headed home to be greeted with an amazing dinner. 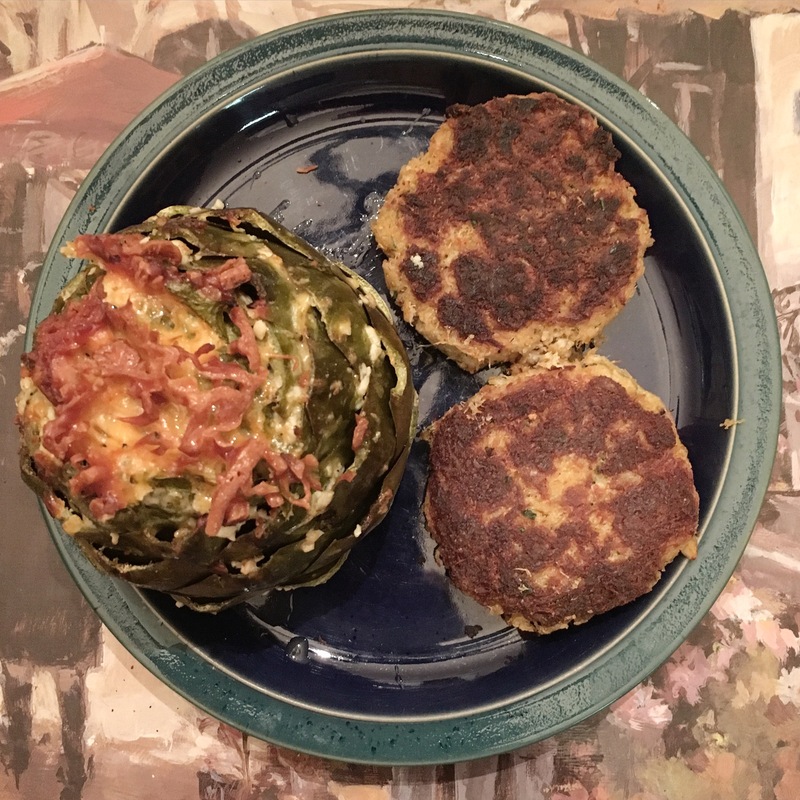 Cajun Crab Cakes and a Parmesan Baked Artichoke. So Yummy! Followed up this delicious dish with a 50/50 Bar and a bottle of water. Time to do my 22 Push-ups and head to bed! Workout: Day 2 of Insanity Max 30: Tabata Power (Maxed Out at 10:20), used Acid Check Granules, Beachbody Performance Hydrate and Energize mixed in water. Post-Workout: 3 – The Final 3 Capsules for Recovery, Half a Peanut Butter Sandwich, and Chewy Granola Bar. Its been a little while since I have really made the effort to keep you all in the loop. I know that when I used to blog everyday about my workouts and what I ate, I definitely stayed more accountable for the things I put in my body. My motivation was that if I was going to be transparent and write about it, then I would watch what I ate and keep up with the training that I needed to get done to accomplish the goals that I have. Namely, I want to eat healthy things so I feel better, be the best triathlete I can be, help inspire people to set and reach goals in their lives, and while doing all of this I want to have a balanced family life and be a good influence for my children. So in an effort to reclaim a bit of what I may have lost over the past year or so since I deviated from what was working, I am back on the wagon. Its time to get back to doing what works. Doing a daily workout program, documenting my nutrition, and using this as a diary of sorts will help to keep me motivated to carry on and reach my goals. This has worked for others and it works for me, maybe it will work for you? Or maybe not? The question is what are you willing to do to ensure that you reach your goals? Are you willing to do something a bit out of the ordinary. Are you ready to be the person you want to be? All I can say is that I am tired of half-assing it and doing just enough to get by. Its time to go all in and be the person I know I can be. I owe it to myself, to my family, and to the kids and people I coach. This is my motivation and it works for me. Thank you for having me back! So here I am sitting behind my computer on a Sunday afternoon reflecting on this past week in anticipation for the week to come. What a week! I have to tell you how energizing, productive, and fulfilling it was, but I really don’t know where to start. When in doubt, begin at the beginning right? Monday the 22nd was a great beginning to the week with a good training ride and the start of the fifth and final week of Focus T25 Alpha Phase. Tuesday was the first day of being a substitute teacher with the Kern High School District at Bakersfield High School (BHS). Later that evening I was honored to begin coaching Age Group Performance swim at Bakersfield Aquatics Club (BAC). In both cases I was impressed by the kids and their eagerness to have someone believe in them and their abilities. Somewhere in the mix of the day’s activities I managed to spend a little time with my kids at the skate park and a late workout. Wednesday, it was another day at BHS, but this time I was honored to spend my first day helping out with the AFJROTC. These classes are generally student led but I managed to get in some conversations with these young adults. Definitely looking forward to spending a few more days on this assignment. This day was my first coaching swim all by myself. Such a pleasure and fun filled hour and a half with these awesome kids! Thursday was PT day for the AFJROTC. Right up my alley! Fortunately I am still a bit sore today after five periods of push-ups and sit-ups from their friendly competition and my workout before coaching swim practice later that night. Saturday started with a two hour morning swim workout with BAC. I had two kids show up and they had a great workout! It was good to hear that they were sore for the workouts earlier in the week and even better to see them perform so well during an interval rich workout on this day. I took some time to talk with the kids and their parents about the importance of recovery and nutrition. Later that afternoon I jumped on my bike for a quick recovery ride from the week’s activities. And that brings us to Sunday! A well deserved rest day and the Oscars! Enjoy! Until next week, may your training be strong, and your rest be enjoyable! Upon receiving the Liftfoil I was so excited, I put it on and went for a ride. The compression material was awesome. It fit like a glove but still allowed for unrestricted movement, and the 5mm Float Pad (Integral Non-Absorbent Cycling Chamois – see picture below, new 7mm Float Pad shown) was super comfortable. 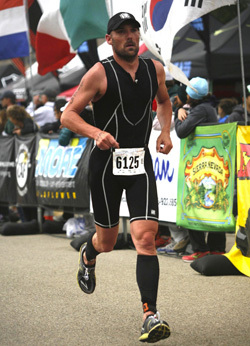 My first big race where I used the Liftfoil was the Wildflower Triathlon – Olympic Distance. This was a race that I had not completed since 1988 (as a 14 year old). It was a windy day, but I finished the race with the help of my new De Soto Sport Gear. I thought the pictures that were taken at the race were decent so I sent them to De Soto Sport. They must have like them too since they later used them online to promote this trisuit. I didn’t even know about it until one of my friends sent me a link, and there I was wearing the Speedsuit, Compression Leg Sleeves, Skin Cooler Run Cap, and Race Belt! Such a cool gesture on their part! 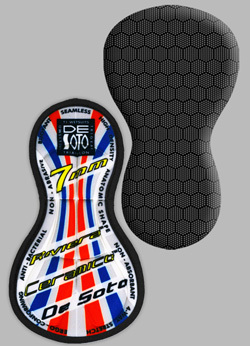 I was and still am surprised that those pictures are up today at https://www.desotosport.com/collections/forza/products/riviera-mens-liftfoil-w-7mm-ceramico-pad. Thank you De Soto Sport for recognizing some of the age-groupers in the sport. Your products help us all to be the best the we can be while we train and on race day. I love wearing your gear and look forward to upgrading the arsenal for this year’s race schedule! Infact I like wearing the Liftfoil so much that it is my primary outfit for training as well as racing and has remained so for the last 2 years. After wearing this trisuit well over 200 times I can report that it has held together beautifully. The flatlock-stitching has kept the panels together and the float pad in place with only minor thread breakage. The float pad has also remained comfortable and has not broken down due to the heavy use it has received. It has never become waterlogged and has kept me virtually rash free as it’s design intended. I look forward to using the remaining life out of this trisuit and upgrading to the new model in the next few months. Maybe before the next Wildflower as I attempt the Long Course this time? Who knows? The 2015 Liftfoil has the Patent Pending Integrated 7mm Ceramico™ Pad. This suit will help you swim faster in triathlons that do not permit wetsuits. Unlike similar “swimskins” that require you to remove them after the swim portion, the Liftfoil, with its Floatpad™, is designed so that you can swim, then bike, then run, all in complete comfort and without having to change. 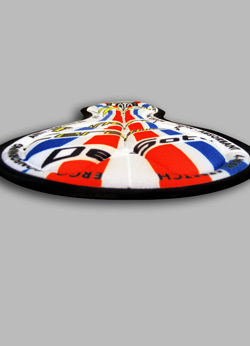 This pad floats and stretches which means it can be used as a race piece in a triathlon. On the bike, the pad stretches with the short and follows your skin as it moves with every pedal stroke, eliminating the friction that can cause irritation or rashes. It has no pockets and is ideal for shorter triathlons where you do not need pockets, and where you ultimate goal is to finish faster without ever changing. It also works well for longer triathlons that do not permit the use of wetsuits. In this case, we suggest the use of a fuelbelt, or changing from swim to bike to run given that the time required to change is minimal compared to the rest of the race. 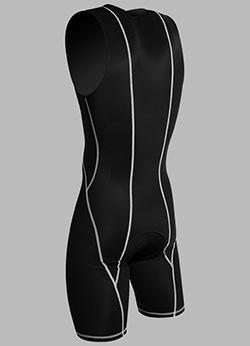 This speedsuit has no rubberized material, no polyurethane, and no neoprene. It abides to WTC’s recent ruling on swimskins, speedskins, swim apparel…whatever WTC wants to call it. The Liftfoil has no pockets and no lining. It is designed to help you swim faster during non-wetsuit swims. Designed with a front zipper (16-inch YKK® zipper) which allows you to ventilate by unzipping during the run. 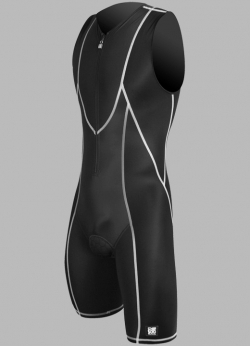 Our front-zipper design for men swims better and faster than rear zipper suits. We are the only company that has figured out how to do this so we are the only company with a front-zipper Speedsuit. Hydrolinear™ seamlines hug your body while allowing for maximum reach and glide in your stroke, with no friction against your skin. Our tests have shown varied improvements of swim times of about 2-4 seconds per 100 meters, depending on the individual, over a conventional swimsuit. This translates to 1’00” for 1500 meters and 2’40” for a swim of 4000 meters. Of course, as with all our products, we offer a 100% satisfaction guarantee. Test it for yourself. If you do not find it performs to your expectations, you may return it for a complete refund. 1. Swim faster in it and use it either as a speedsuit or a trisuit in triathlons. 2. Swim, bike and run it it. 3. Made for races that do not allow wetsuits. 4. No rubberized material, no polyurethane, no neoprene. 5. Now offered with coldblack® cooling and UV protection technology! 7. 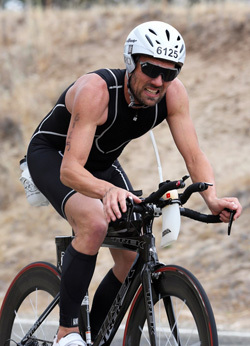 Approved for all USAT sanctioned races, and WTC legal for all Ironman and 70.3 races. This garment is not designed for repeated use as a swimsuit in a chlorinated pool. Light colored textiles reflect both visible and invisible rays of sunlight, meaning both heat and light. Dark colored textiles absorb both types of rays and therefore absorb heat. coldblack® reduces this absorption of heat rays, particularly in the case of darker colors, and in all types of textiles. The result is tangibly better heat management. Because textiles finished with coldblack® heat up less in all colors compared with material without a coldblack® finish. The coldblack® technology guarantees a minimum UPF 30 protection (blocks 70% of UV rays) when applied to any textile in any color without affecting the look or feel of the product. As a result, textiles with coldblack® can make an effective contribution to protecting against harmful UV rays.